This weekend I want to escape from Florence. Maybe because this week has been really hot, but I need a break from Florence’s heat. On Saturday morning I’ll visit the exhibit “From Fattori to Casorati. Masterpieces from the Ojetti Collection” at Matteucci Center for Modern Art. It is open Tuesday to Sunday from 10 am to 1 pm and displays some unique Italian masterpieces such as After the battle of Magenta by Giovanni Fattori. Then I want to spend my day on the beach sunbathing and taking swims in the sea. In the late afternoon, I’ll move on to Lucca for the celebrations of San Paolino. This year celebrations will go on for 3 days. On Saturday from 6 pm till late night the borough of San Paolino in the historical center of Lucca will be animated by a medieval festival with musicians, costumed characters and shops open. On Sunday I’ll spend the day in Lucca. 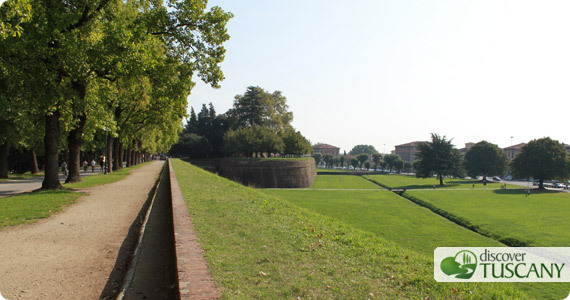 First I want to bike over Lucca’s ancient walls. The walls are incredible and from up there you can enjoy a beautiful and particular view of the center. Then I want to visit Lucca and see San Michele Church with its particularly rich facade, the Cathedral of San Martino, displaying the Holy Face, and the Cathedral Museum, the famous Amphitheater Piazza and all the other monuments of Lucca. Starting at 8.30 pm the Luminara of San Paolino, a costume parade that lights up the center of Lucca, begins in Piazzale Verdi. The parade ends up at San Paolino Church for the blessing of the Palio around 10.30 pm. Even though I won’t be in Lucca on Monday, the celebrations of San Paolino will end with the Palio of San Paolino or Palio della Balestra (Brossbow) starting at 10 pm in Piazza San Martino.